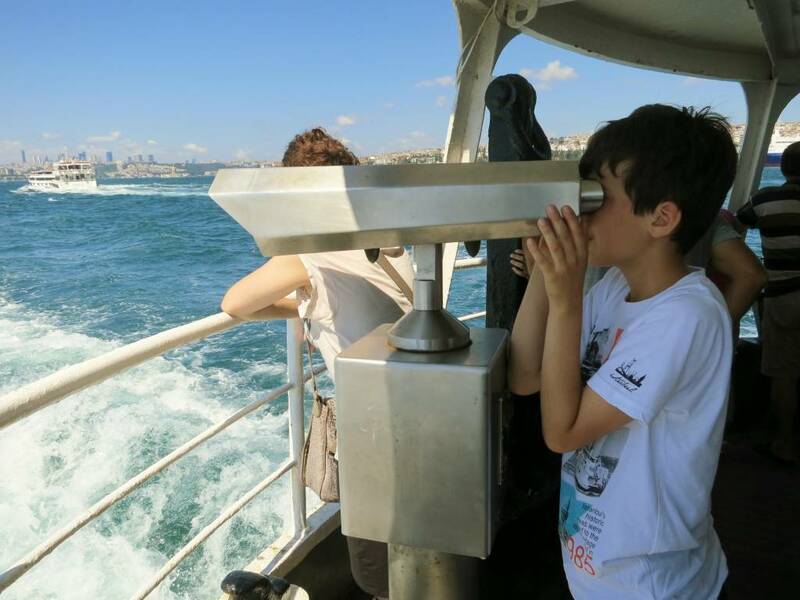 Istanbul’dan merhaba! Home, sweet home; I think the more I age, home, my roots calls me even more eagerly, it is wonderful to be back home. Here are a few snap shots of what we have been up to. 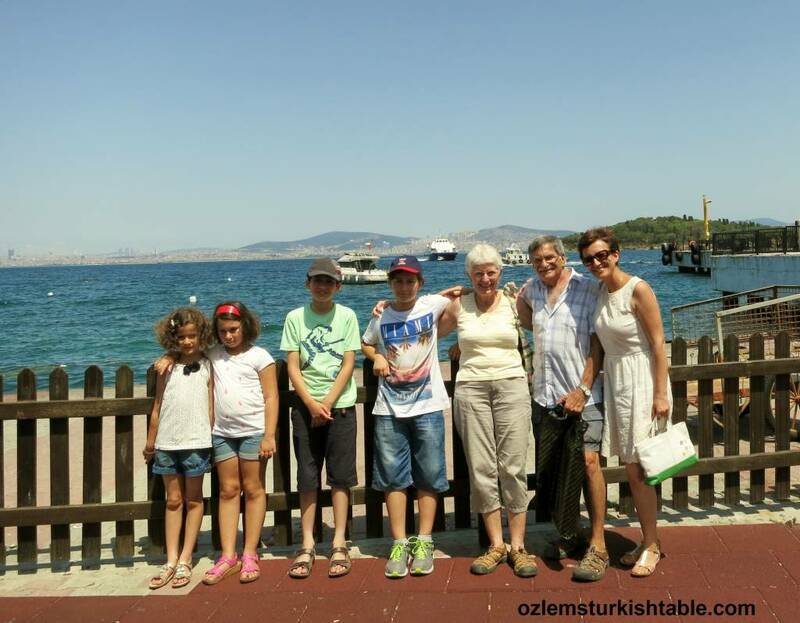 It’s been only a few days since we’ve been here and we managed to fit in a lot of family visits and said “Mutlu Bayramlar.” I especially enjoyed having a chance to visit the elderly with the children, hearing their stories to them, such precious moments to savour. 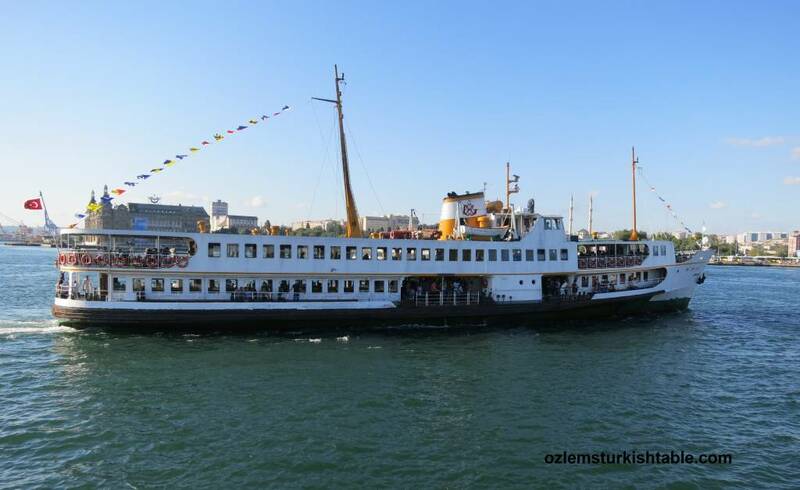 Istanbul is the place to be during the Bayram holiday as most folks left for holidays. So wonderful to be able to enjoy the city minus the traffic. 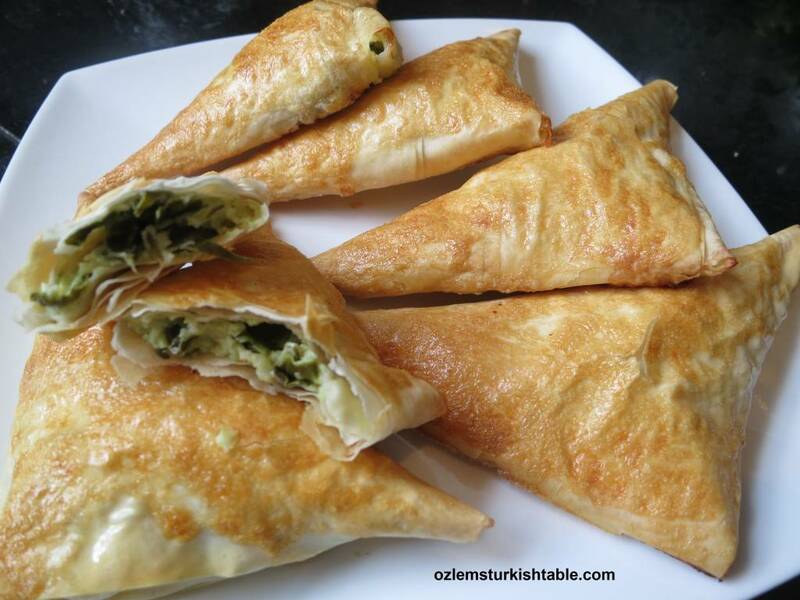 Cay, peynirli borek, Turkish tray bake pastry with cheese and parsley and pogaca made a very warm welcome home. One of the things I very much long is enjoying a vast array of freshly prepared mezzes and enjoying them along the Bosphorus. With a beautiful breeze and friends and family nearby, it is heavenly. 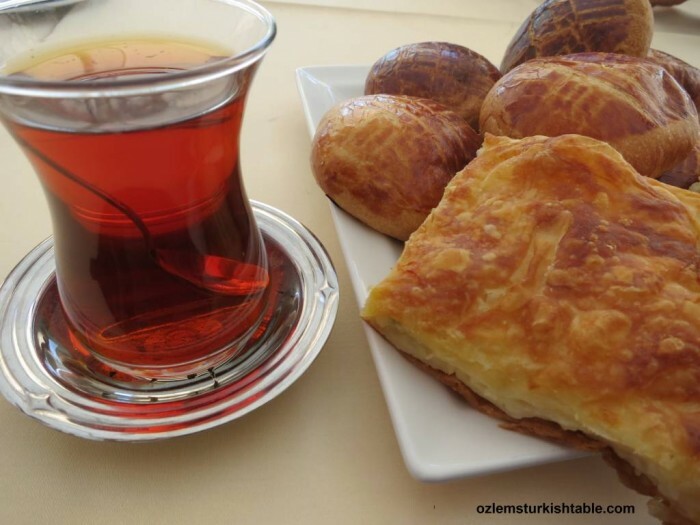 I was grateful that a few dear friends were still in Istanbul during Bayram and we enjoyed a long, leisurely Turkish breakfast and multiple glasses of cay at Rumelihisari, Sade Kahve. 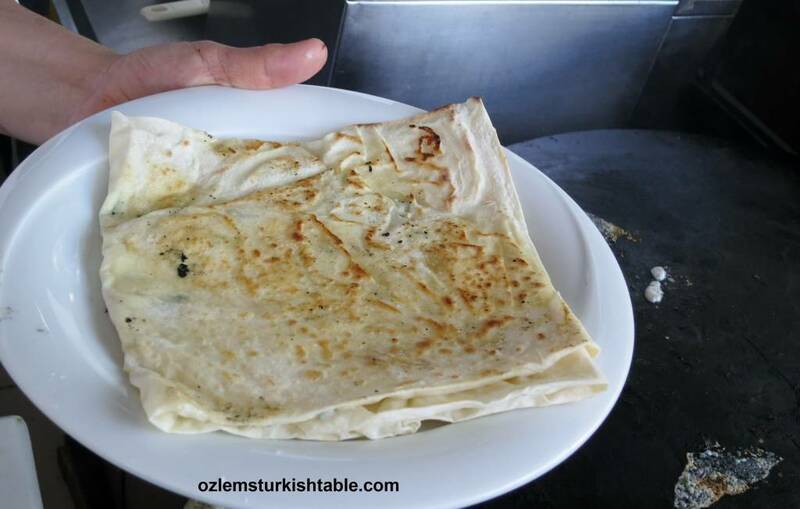 Gozlemes, Anatolian flat breads with fillings are made at the oval sac oven in front of you, with an infectious smile. Impossible to pass on. Of course, one can also have a delightful glass of cay and Simit, sesame encrusted bread rings to nibble while on the ferry – again, served with a wonderful smile. 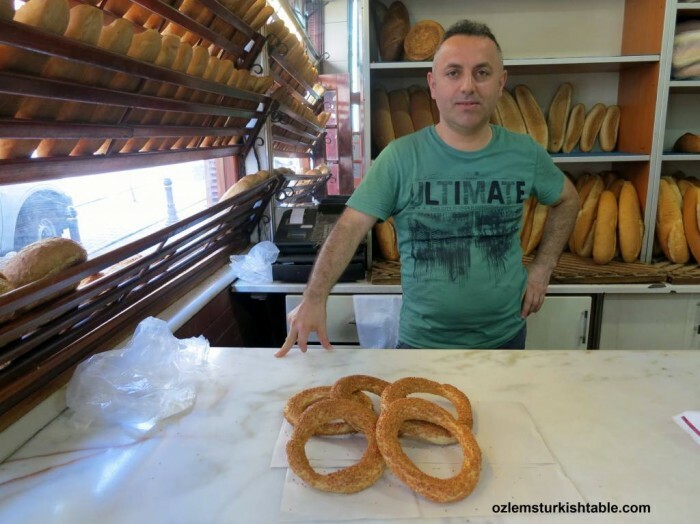 Once in Kadikoy, we decided we need more Simit; so popped in the local bakery to get some more, along with some white cheese, beyaz peynir and tomatoes for the afternoon tea at our Meskure Hala, our dear aunt. The following day started with a visit to Besiktas; I love Besiktas Carsisi; it’s market, small scale shops, fish monger and endless eatries. It has a village feel where folks greet one another, get their daily bread from the bakery, firin, the Turkish coffee and nuts from the local kuruyemisci; the list goes on and on. 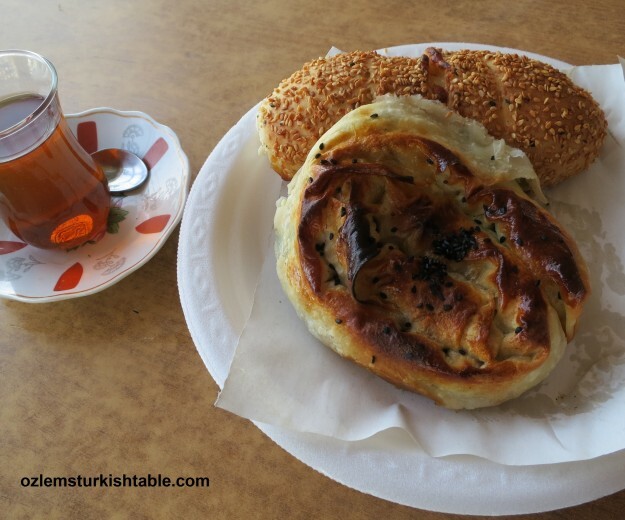 I got lost for words at Simit Molasi Cafe – Sigara Boregi; pastry rolls with cheese and parsley for us. 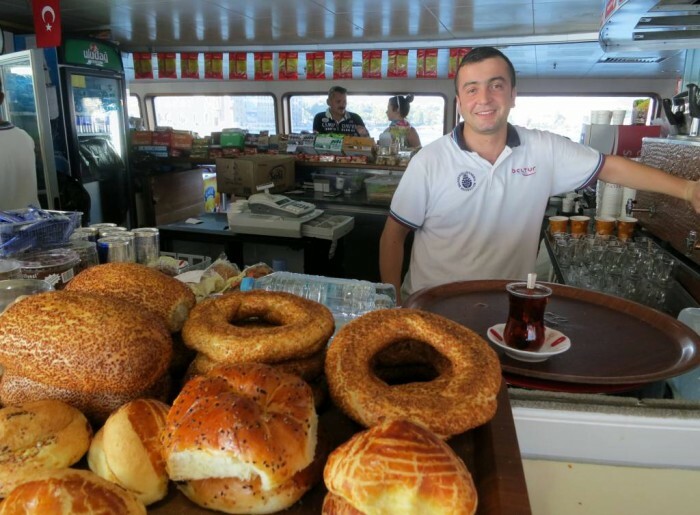 And more simit, if one desires more. Next stop is Ortakoy; lovely to see the restoration at the Ortakoy Mosque is compiled – looks fascinating. 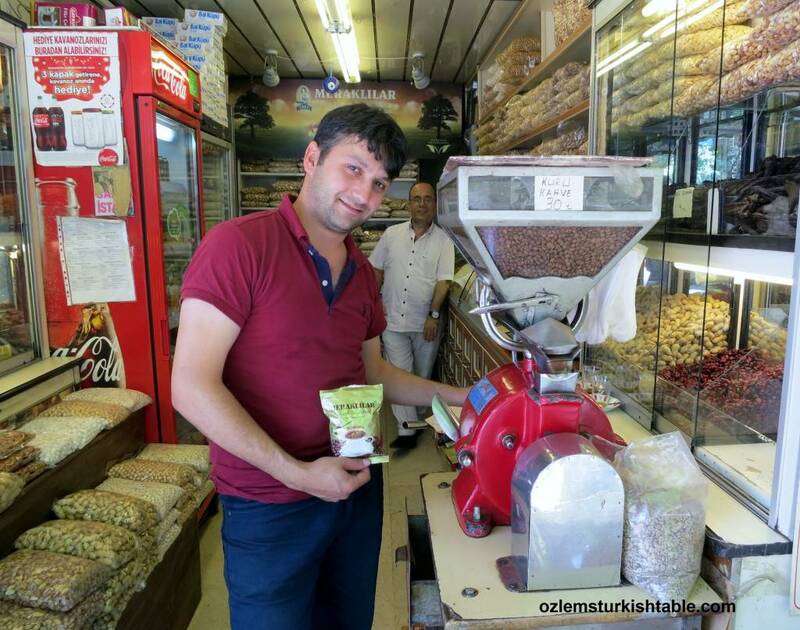 If you’re after a really good quality Turkish delight, have a look at Yeni Ugur Helvacisi in Ortakoy; I loved their new Turkish delight with pomegranates, they are packed with flavor. 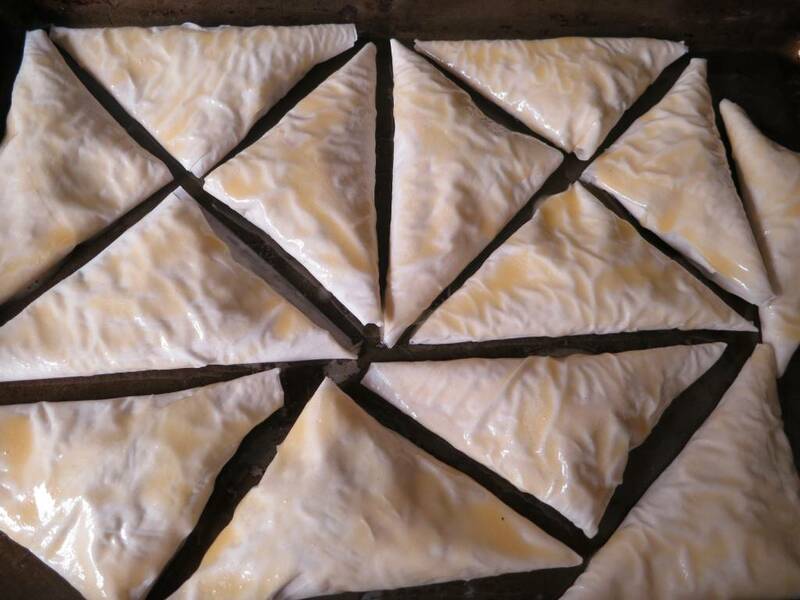 If you fancy making your own Turkish Delight, here is my home made Turkish Delight recipe. Last stop, freshly ground Turkish coffee at Meraklilar Kuruyemiscisi, Ortakoy; smells heavenly. 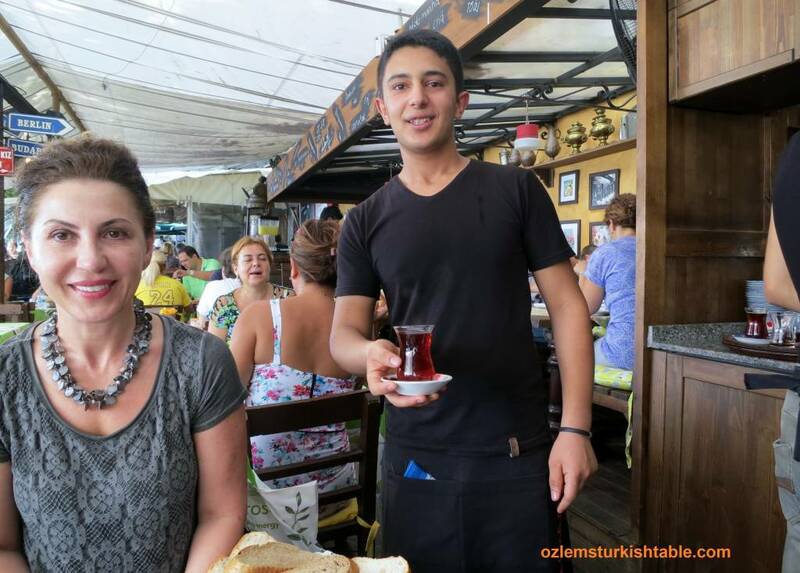 Hope you enjoy yours, Turkish coffee really is more than a drink – afiyet olsun! It’s our last day in Istanbul before we depart for Bodrum and we took the ferry to Burgazada, one of the Princes’ islands near to Istanbul. Children got very excited with the prospect of getting on the ferry again and riding bicycle in the Island. We had a special purpose of this visit too, as we arranged to meet up with dear Mark and Jolee from the wonderful blog Senior Dogs Abroad. 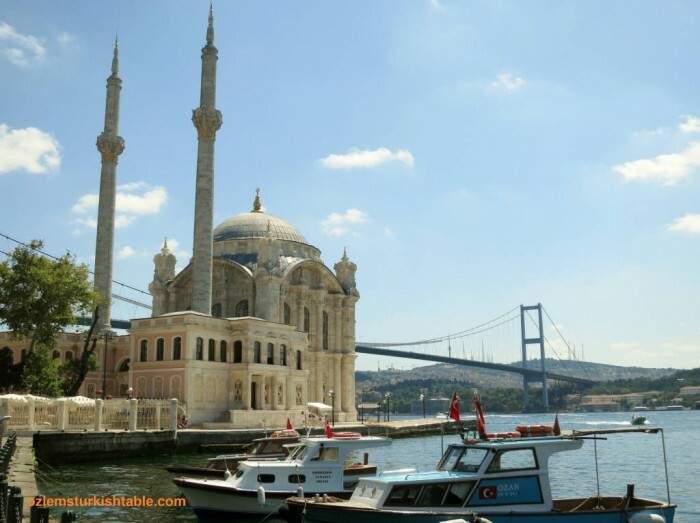 Mark and Jolee live in Istanbul and blog about the life in Turkey as well as world affairs, they’re a pleasure to follow, a delightful company. No vehicles are allowed in the island except the horse carriages and bicycles, which makes the islands even more inviting; a breath of fresh air. Friday is the Market day, Pazar in Burgazada and I am grateful that the Senior Dogs kindly guided us to the right direction! 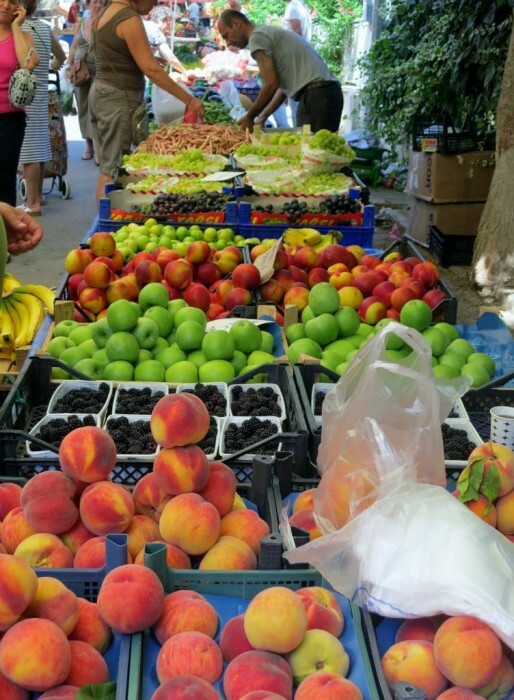 Fresh, breathtaking produce galore; one can easily spend a day there, just wonderful. 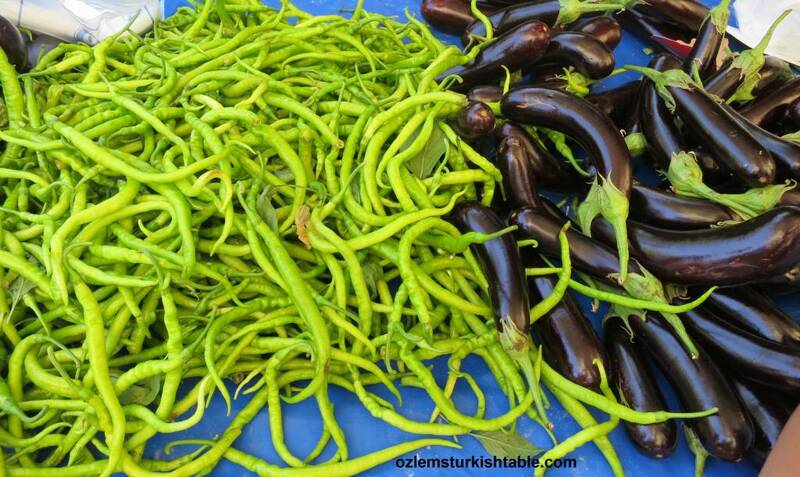 Sivri biber, green pointy peppers and eggplant, patlican at Burgazada. 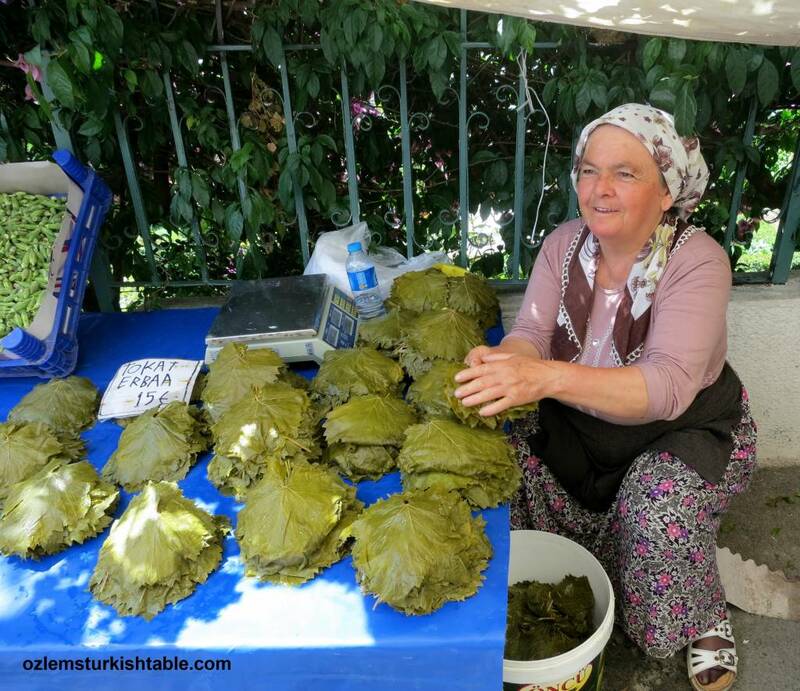 Preserved vine leaves, ready for stuffing, so inviting – presented with a wonderful smile. Time to say farewell and see you soon, many thanks to Mark and Jolee for having us at Burgazada! With best wishes to all; hope to be in touch from Bodrum! 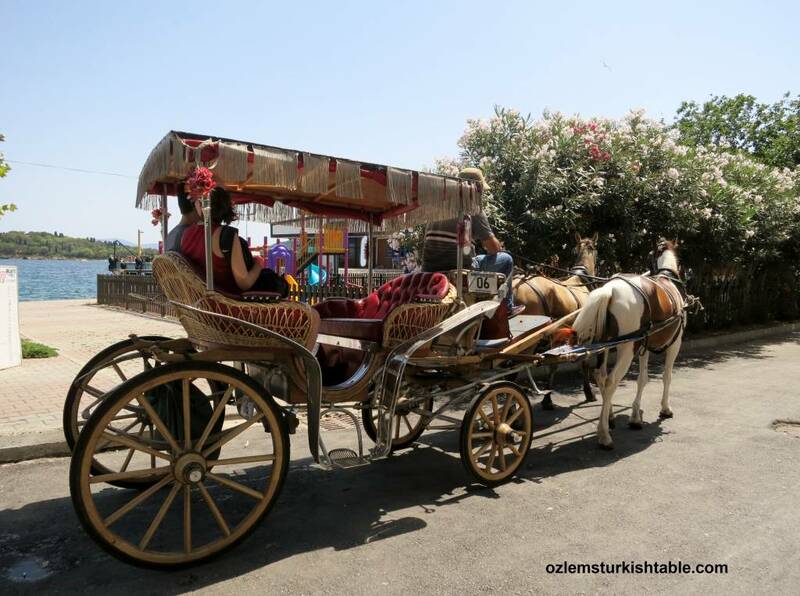 “Time to stop for cay – Turkish tea- and refreshments!”, announced our tour guide on our way to the ancient Pergamum or Pergamon, near by the city of Bergama in Turkey. 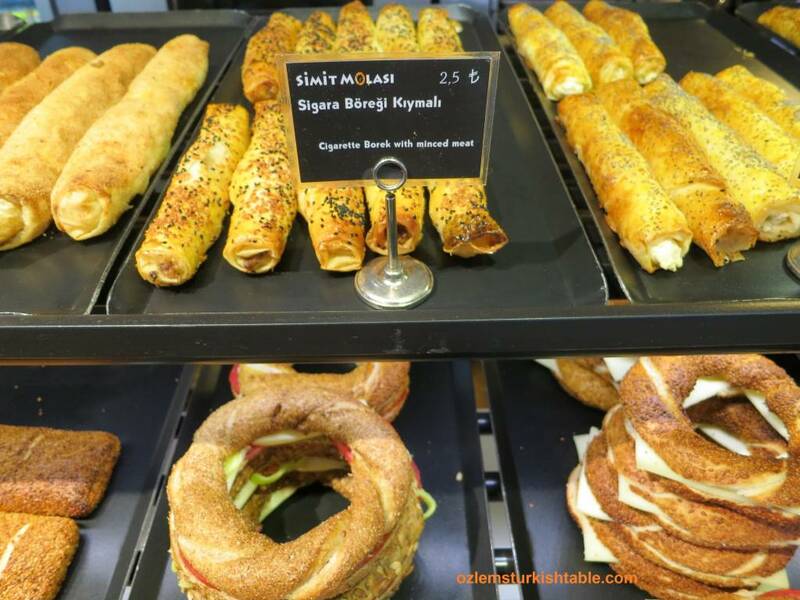 As much as I looked forward to going back to Pergamum, this announcement was music to our ears, as every stop we had in Turkey produced delicious treats. 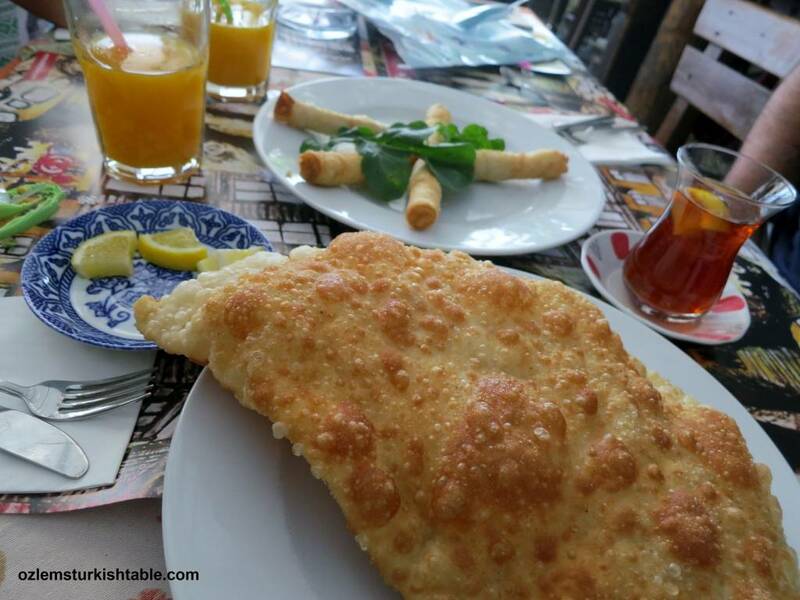 We stopped at a modest local cafe by the side of the motorway and indulged in these freshly baked simits, pastries filled with spinach and cheese; we divided the pastries between us happily and washed down with a glass of cay. Each stop has been full of delicious gastronomic experiences during our tour and the journey to Pergamum was no exception, providing a lot of culinary delights. Freshly squeezed nar suyu, pomegranate juice – delicious and packed with goodness. 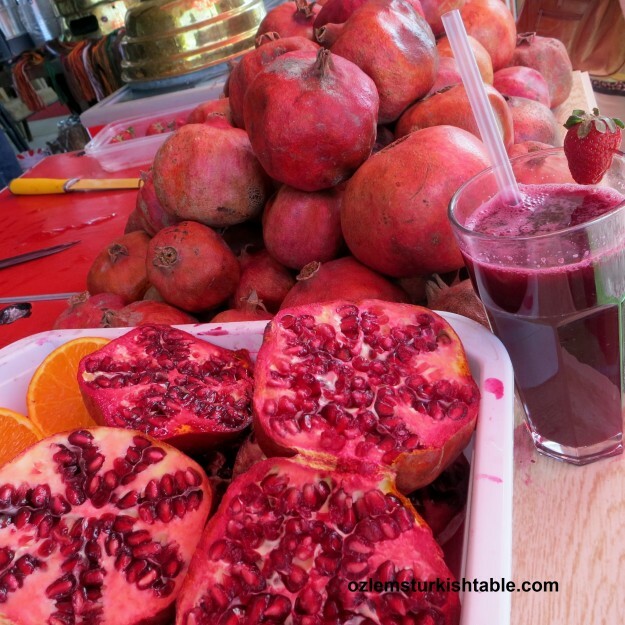 Have you ever had freshly squeezed pomegranate juice? Right by the entrance of Pergamum, lined delicious food and drink stalls, and we shared a glass – so refreshing and punchy, packed with goodness and flavour. Pomegranates feature often in Turkish cuisine. 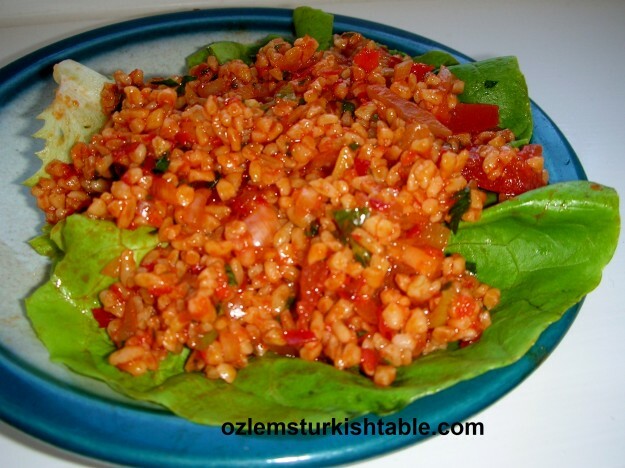 We use the thick & delicious pomegranate molasses sauce in Bulgur wheat salad, Kisir, a specialty in the southeast of Turkey, from where the country’s spicier dishes hail. Kisir is offered as a welcome to the guests in the homes of Antakya, where my roots are from, and in Gaziantep. It can be rolled into balls and served nestling in crunchy lettuce leaves. This dish is perfect for buffets or as part of a barbecue spread. It really is a “bowl of health and goodness” with fresh vegetables, bulgur – packed with fiber – and pomegranate sauce, full of antioxidants. 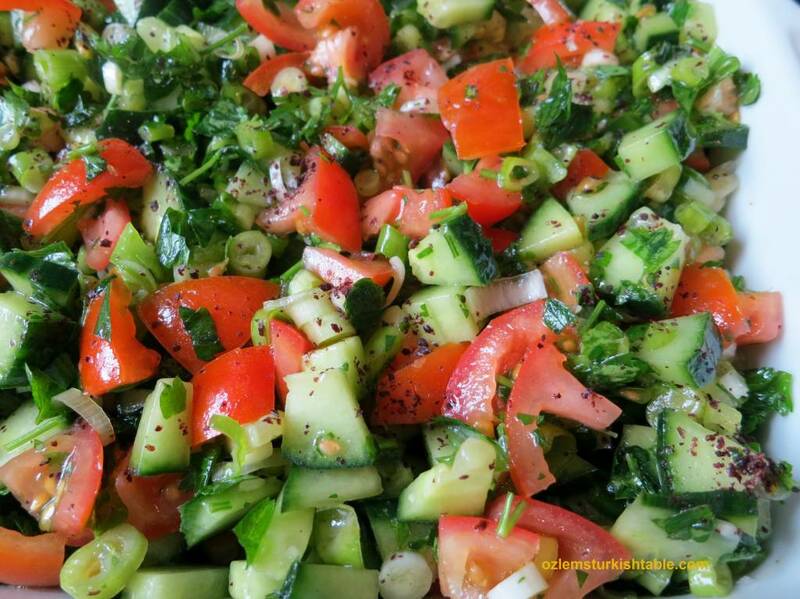 This delicious vegetarian salad tastes even better the next day! 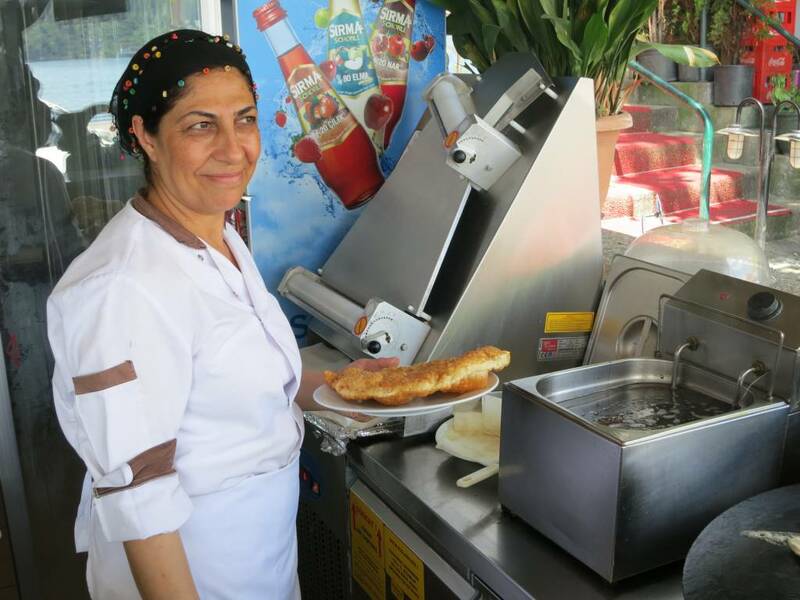 Some of the folks couldn’t resist the wonderfully thick Turkish ice cream, “Maras Dondurmasi”. 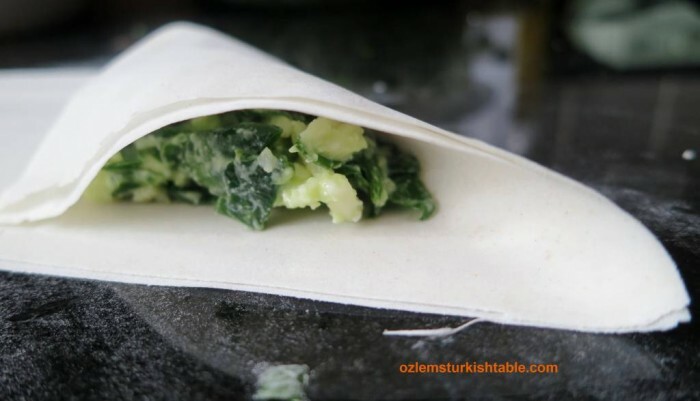 As the name says, it is a specialty from the Maras region in Southeast Turkey; very tasty and thick that you can actually slice with a knife and eat with your fork. 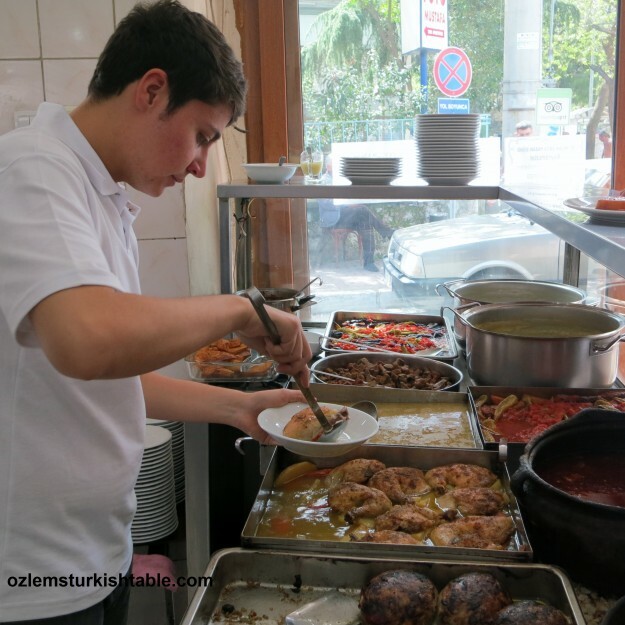 But above all, it was our lunch stop at the local eatery, Altin Kepce (translated as “Golden Ladle” in English) in Bergama that stole our hearts. A small, family owned restaurant tucked in at the side road, where locals, traders, villagers congregate for lunch; it is buzzing and their freshly prepared, generous food ever delicious. Some enjoyed the Kuru Fasulye- Turkish dried beans casserole with vegetables, and some tried the Zeytinyagli Patlican – Eggplants cooked in olive oil with vegetables or their famous koftes, meatballs. Meatballs with peppers and potatoes, eggplants cooked in olive oil and the ayran (Turkish yoghurt drink) – a delicous feast. 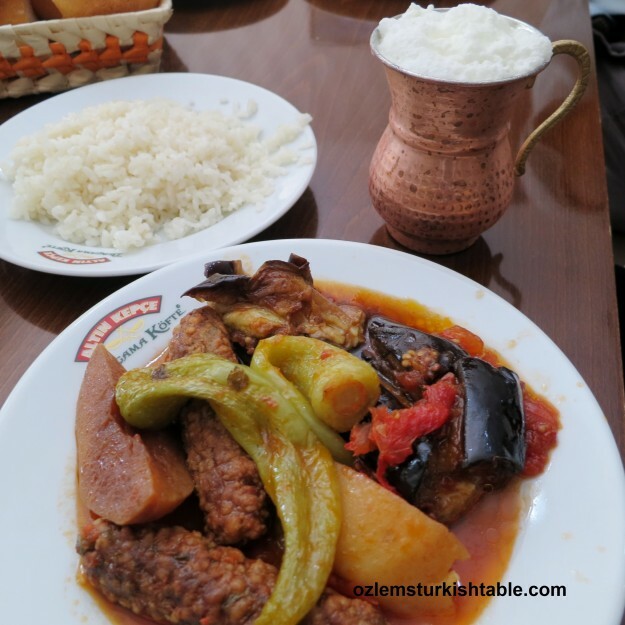 I opted for a mixed plate of eggplants cooked in olive oil and the Turkish meatballs with potatoes and peppers, it was a delicious feast with the frothiest of Ayran, Turkish yoghurt drink. Here is my recipe for the popular meatball and vegetable casserole (not only with the children but with the adults too!) that can either be cooked on the stove top or baked in the oven. It makes a complete and hearty main course served with plain white rice or a slice of crusty bread. 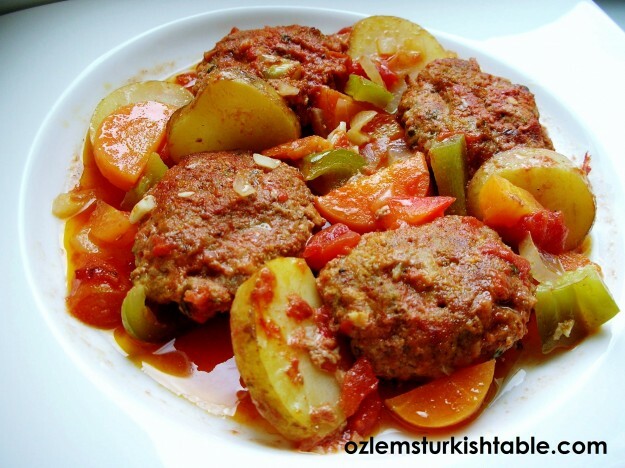 This is Izmir Kofte my way, as I like to add some more vegetables. You can add as much red pepper flakes as you would like for a spicier flavor. The frothiest, refreshing Ayran, Turkish yoghurt drink at Altin Kepce, Bergama. 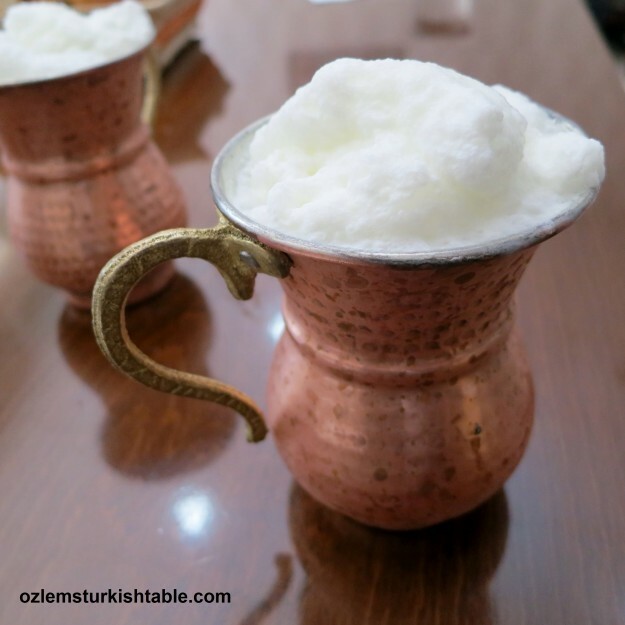 Have you ever tried our traditional drink Ayran? Ayran is a mixture of plain natural yoghurt (preferably whole milk), water and a pinch of salt blended together, similar to buttermilk. To make ayran, blend 2 cups of plain yoghurt with 1 cup water with a pinch of salt, for about 20 seconds. You will see a nice thick foam and bubbles formed at the top. Serve in water glasses with a few ice cubes in them. You may also add a few fresh mint leaves for a refreshing taste. Ayran is a popular drink at home, especially with kebabs and casseroles, and it would go well with this casserole too. 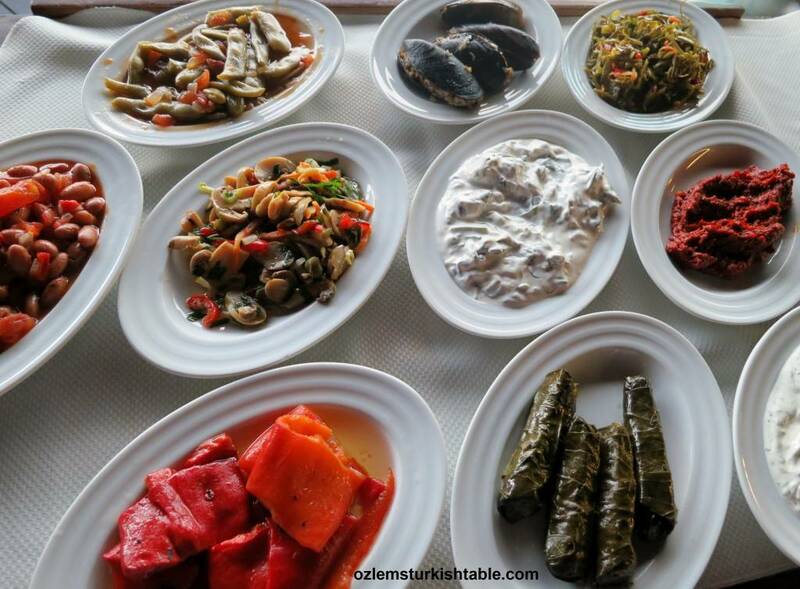 Our feast at Altin Kepce – Bergama ended with the delicious, met-in-the-mouth Kemalpasa dessert. 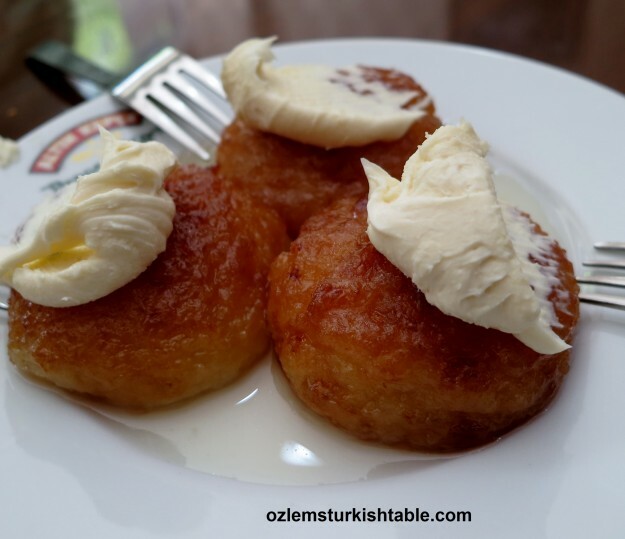 The dessert takes its name from the name from the town of Kemalpasa, part of the city of Bursa. 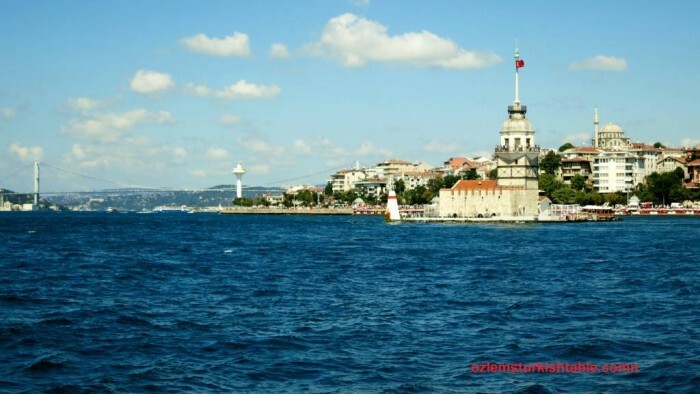 And the town takes its name from the founder of Republic of Turkey, the great leader Mustafa Kemal Atatürk. This dessert contains a special cheese produced in this town, though you can substitute with a mild, unsalted white cheese like mozarella. 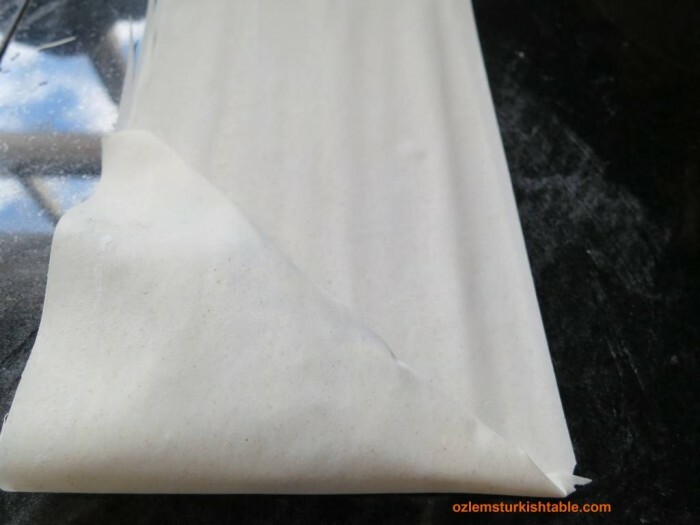 You can buy the precooked cookies of the Kemalpasa dessert sold in packages all around Turkey and all you need to do is to prepare the sherbet to soak them in. Apparently this dessert has such a significant role in the life of the town that there is even a Kemalpasa dessert festival on September 14th. 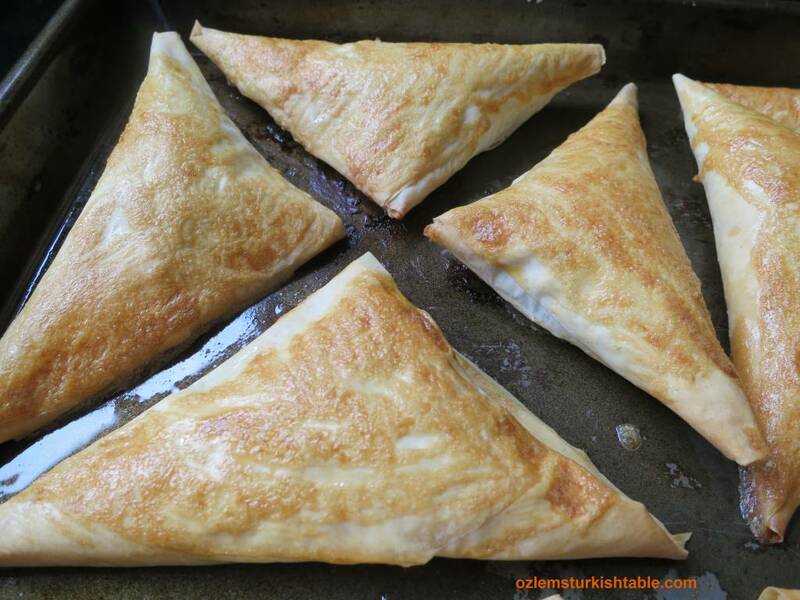 Zerrin from Give Recipe has a fabulous Kemalpasa recipe, if you would like to have a go. 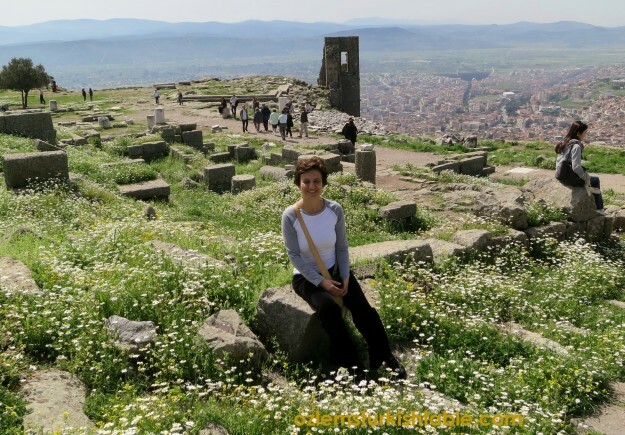 We finally made it to Pergamum in a beautiful spring day. 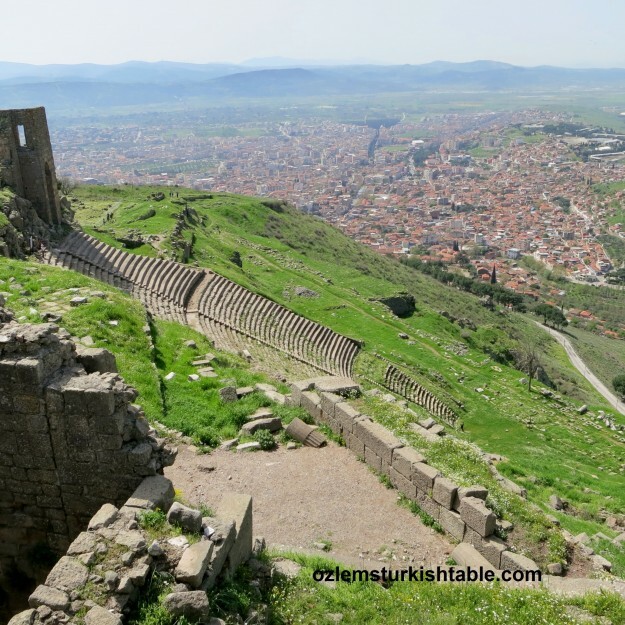 Built on a conical hill rising 1,000 feet above the surrounding valley, Pergamum (also spelled Pergamon, from the Greek for “citadel”) was an important capital city in ancient times. 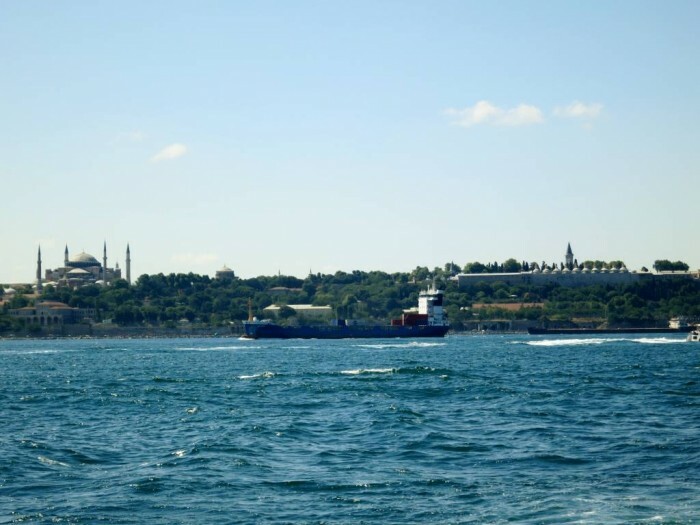 Its modern successor is the Turkish city of Bergama and this magnificent site over looks to Bergama. 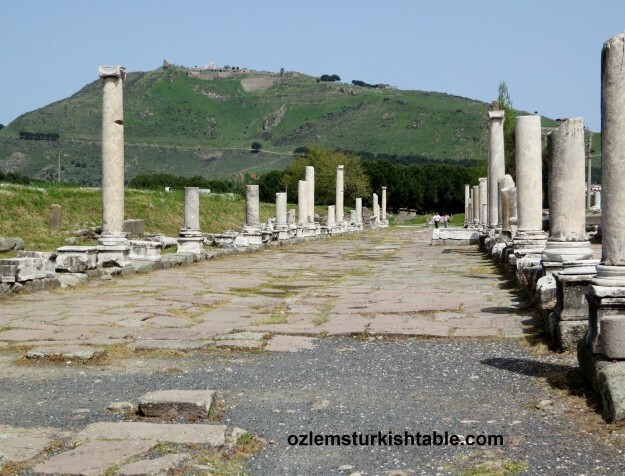 Bergama has an important archaeological significance, as the city not only hosts Pergamum’s acropolis but also Asklepion, both of which are both listed among the top 100 historical sites on the Mediterranean. Most of the buildings and monuments in Pergamum date to the time of Eumenes II (197-159 BC), including the famed library, the terrace of the spectacularly sited hillside theater, the main palace, the Altar of Zeus, and the propylaeum of the Temple of Athena. In the early Christian era, Pergamum’s church was a major center of Christianity and was one of the Seven Churches of Revelation. 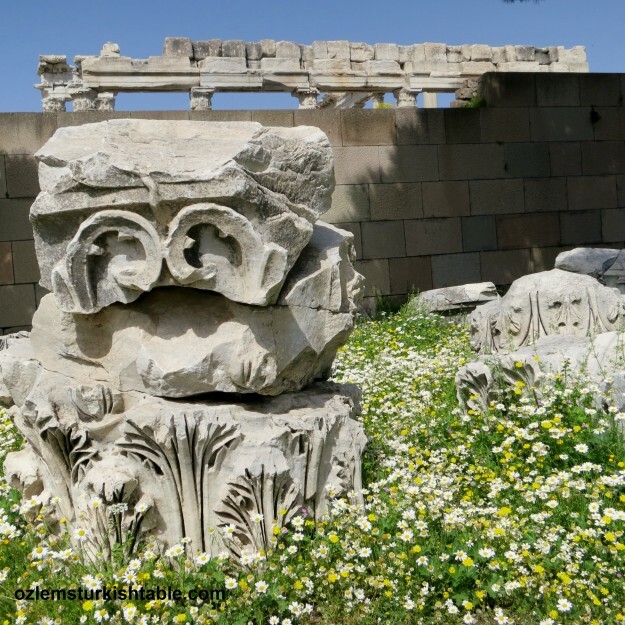 While you are in Bergama area, it is also worth visiting The Asklepion; a famed ancient medical center built in honor of Asklepios, the god of healing. It was also the world’s first psychiatric hospital. The treatments included psychotherapy, massage, herbal remedies, mud and bathing treatments, the interpretation of dreams, and the drinking of water. The Asklepion and the Pergamum at the top of the hill, stunning view. I was told the next bloom in Pergamum will be poppies; no doubt they will look stunning next to these fascinating sites – maybe you can catch that one? I hope the food, recipes or sites here inspires and you enjoyed the read.